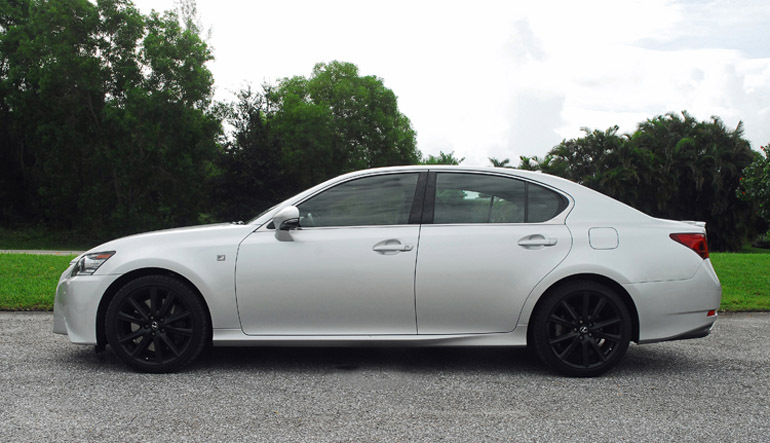 The all-new 2013 Lexus GS350 mid-size luxury sedan receives a much needed infusion of higher levels of performance and precision to keep the Lexus enthusiasts happy as the premium segment continues to offer sedans that take performance seriously. The new GS350 F SPORT takes performance a step further without sacrificing the trademark Lexus ride comfort and luxurious interior. The new F SPORT features a sport-tuned suspension with firmer springs, thicker anti-roll bars, larger front brake rotors and high-friction brake pads, an adaptive variable damping system, a variable ratio steering system, and bushing changes. What stays the same is the potent 3.5 liter V6 with direct injection, four cams, four valves per cylinder, an aluminum block & heads with dual Variable Valve Timing with intelligence. The engine also features improved intake and exhaust sound characteristics via an intake sound enhancer and optimized muffler chamber that complement the higher handling performance levels. Horsepower is rated at 306 at 6,200 and 274lb.ft. of torque at just 3,600rpm. This potent engine is mated to a smooth-shifting six-speed automatic with paddle shifters to be able to hold each gear up to the redline. The Adaptive Variable Suspension system has four-driving modes that you can change by turning a large dial on the left side on the center console. This system enabled me to customize the driving experience I wanted to enjoy. ECO mode revises throttle mapping, seat heating and climate control systems for better fuel economy. 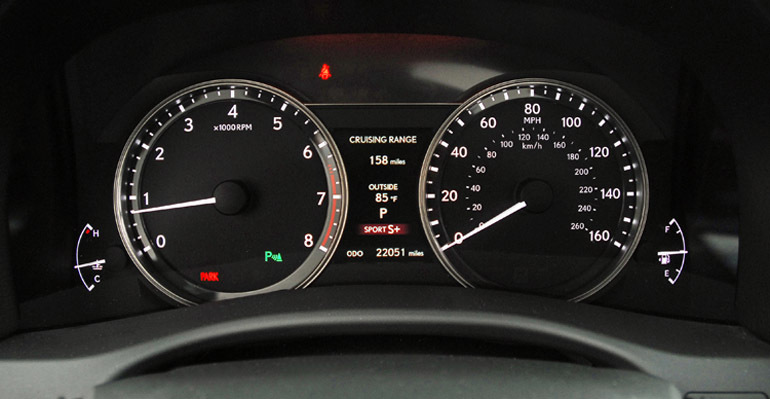 In ECO mode the instrument cluster lighting turns to blue. Normal mode is when you want a little more performance than ECO mode. SPORT S mode revises throttle mapping and transmission shifting priorities to fully exploit the capabilities of the Powertrain. In Sport S the meter lighting changes to red. 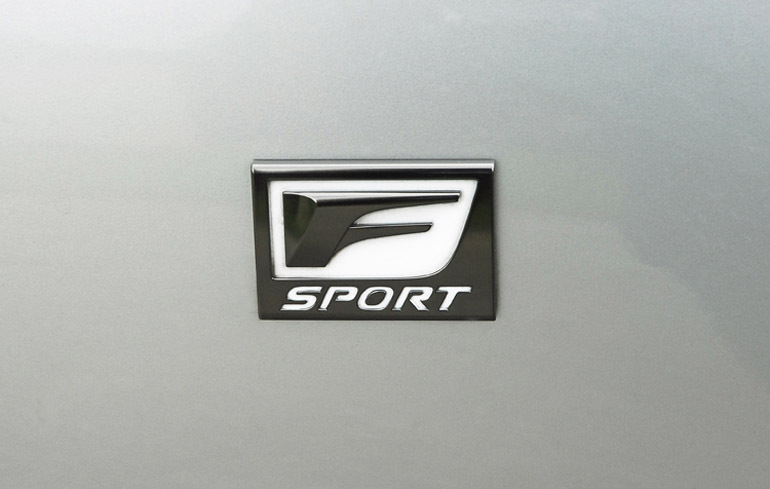 The F SPORT exclusively offers Sport S+ mode that engages handling enhancements via a sport setting of the adaptive variable suspension, steering system, and Vehicle Dynamic Integrated Management (VDIM) together with the powertrain enhancements of SPORT S mode. 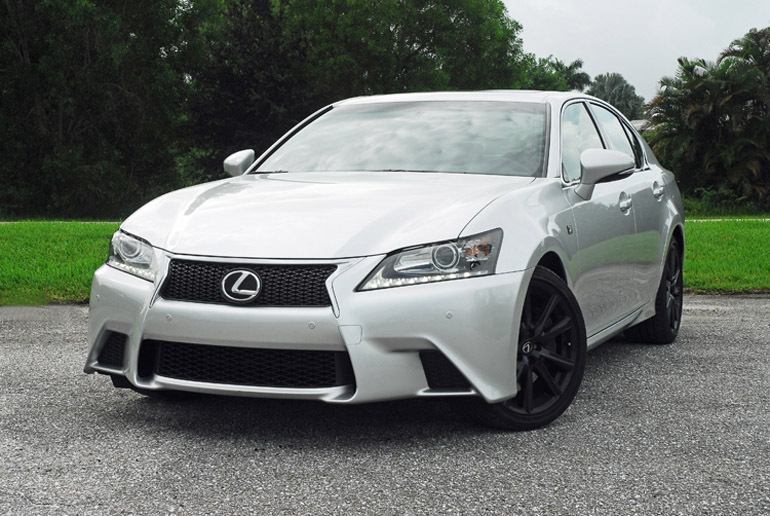 The new F SPORT also offers an optional Lexus Dynamic Handling (LDH) system with Dynamic Rear Steering (DRS). This newly developed technology offers Lexus’s first integration of DRS; Electric Power Steering; and Variable Gear Ratio Steering (VGRS). It monitors vehicle speed, steering direction and my driving inputs, the system than can independently manage both front and rear wheel steering angles to help improve turn-in response, rear grip, vehicle control and overall agility when cornering hard. With all of these technologies working together you can really feel the higher rate springs, damper rates and 19X9 inch rear tires griping the road when approaching and exiting a tight turn at high speed. 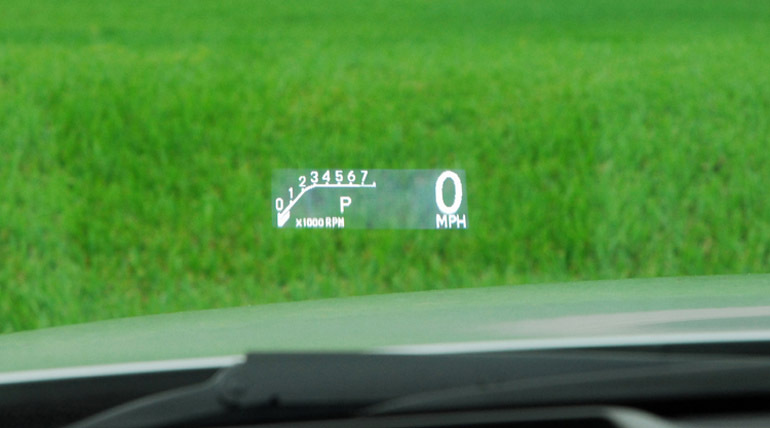 Also enabling these systems to work so harmoniously is the special calibration of the VDIM as it anticipates loss of vehicle control and governs all of the car’s dynamic handling systems-the ABS, BA, VSC (Vehicle Stability Control), and Traction Control-with the electronic throttle control system. VDIM employs these systems collectively and seamlessly to help make corrections while allowing higher dynamic capability. The system also features a limited slip differential effect to put more of the power down on the pavement. Further increasing stability and handling prowess is a more rigid platform with an increased number of spot welds and adding laser welds in very specific locations. A wider track by almost two inches further enhances handling and stability. The new F SPORT is exclusively equipped with 19 inch staggered with wheels and tires-19X8 inch aggressive black graphite front and 19X9 inch black graphite alloy rear wheels. They are wrapped with 235/40R19 inch front and 265/35R19 inch low-profile high-performance tires. Slowing the new G350 F SPORT down from speed are powerful, 4-wheel disc brakes. Up front are large 14 inch vented discs clamped with 4-piston calipers and 12.2 inch vented discs clamped with large single-piston calipers to bring the car to a short, safe stop. 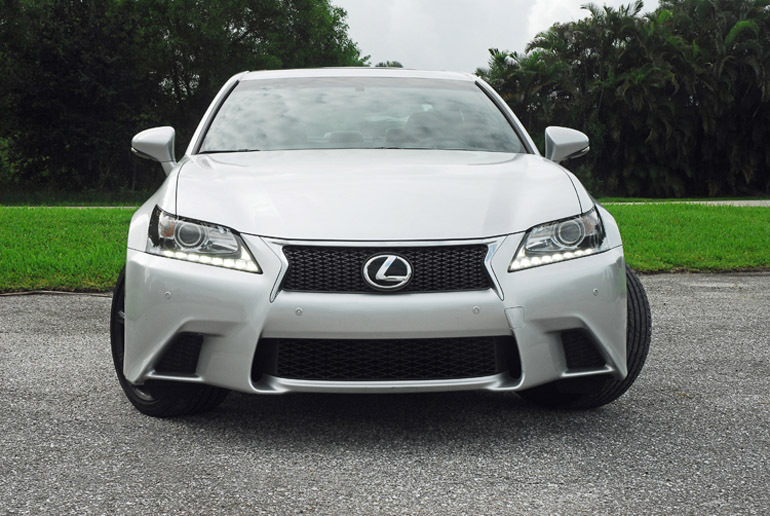 The all-new GS350 F SPORT features exclusive styling with a large front bumper that juts out in the middle and contains mesh grille inserts, openings at the sides to bring cooling air to the front brakes, a splitter with flat panels under to help with airflow, L-shaped LED daytime running lights, HID headlamp clusters, the new Lexus signature chrome spindle grille surround. From the side are steeply raked A-pillars, lower side extensions, a full perimeter chrome strip around the greenhouse, pull-out door handles, aero-styled remote/heated side mirrors and short rear deck with an integrated spoiler. The rear fascia features a distinctive integrated exhaust diffuser with centered aero fins to help control underbody airflow and dual exhausts with chrome surrounds. The new GS350 F SPORT is taut and athletic; it looks like it is moving when parked. 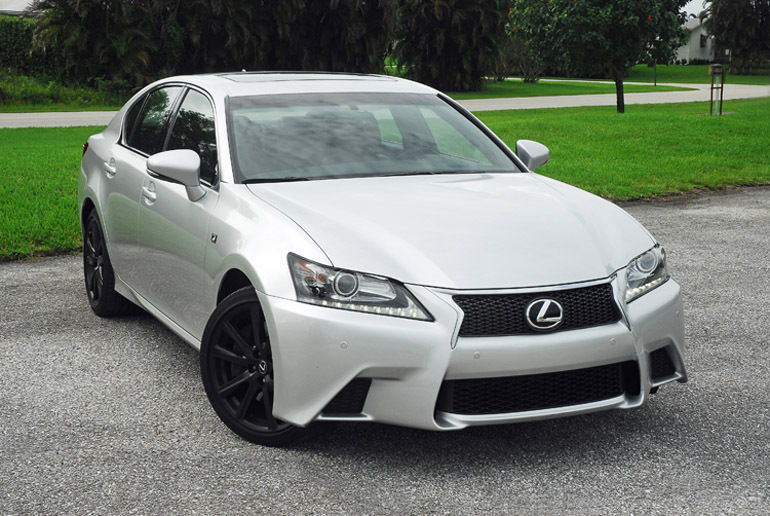 In interior is as luxurious, comfortable, and high-tech as the regular GS350 but with F SPORT cues such as a 16-way powered driver’s seat with power side bolsters, smooth striated aluminum trim on the dashboard, center console and doors, unique perforated leather trimmed seats, black roof headliner, aluminum pedals, a perforated, power tilt/telescopic steering wheel with a distinctive F Sport badge at the bottom and a perforated shift knob. The F Sport package also comes with rain-sensing wipers/washers, heated/ventilated front seats, a power rear sunshade, a Head’s Up display that I really liked using to keep my eyes straight ahead and seeing my speed, tachometer, radio station and gear selected, a Mark Levinson Premium Surround Sound audio system with 17-speakers, 835-watts of power with 7.1 channel architecture, digital amplifier, GreenEdge speaker technology, power sliding sunroof, HDD Navigation with a 12.3 inch high-resolution split screen display and Lexus Enform with Destination & eDistination, application suite, NavWeather, NavTraffic, Sports, Stock, Intuitive Park Assist, Cargo Net, and Trunk mat. All Lexus GS350 sedans come standard with all-express windows/door locks, Smart Entry with push button start/stop, dual zone automatic climate control, automatic recirculation with smog sensor and air filter, white LED interior lighting, Lexus Homelink Universal Transceiver, carpeted floor mats, dual map lights, grab handles above each door, dual cupholders, center console with padded armrest and sliding storage bin, storage slots in each door, cruise control, and a pull-down rear center armrest. Standard safety features include dual front airbags, front/rear side mounted side impact airbags, front/rear side curtain airbags, driver’s/front passenger knee airbags, 3-point safety belts with front pretensioners/load limiters, whiplash injury lessening front seats, front/rear crumple zones, steel beams in each door, safety connect automatic collision notification, stolen vehicle location, emergency assist button (SOS) and a tire pressure monitoring system. 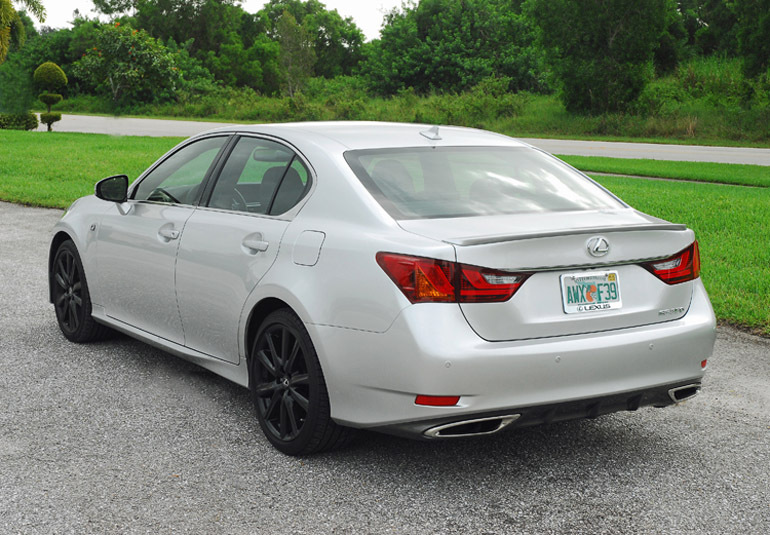 The new 2013 GS350 F SPORT is the real deal that brings more performance and thrills to the mid-size Lexus GS350. It is fun and easy to drive with all of the trademarks that make the Lexus brand one of the world’s best-selling luxury vehicles. EPA cargo volume: 14.3 cu.ft.